What’s Your Favorite Historically-Based Musical? Gazette665’s August theme of the month for our Friday blog posts is History On Broadway: A New Look At Musicals. Let’s kick off the first blog post with a question: What’s your favorite historically-based musical? We’re not saying the history on stage is completely accurate, but we’re looking for plays inspired by real people or real events in the past! Let us know in a comment and we’ll “break a leg” for the rest of the month to bring you some fine performances on the blog! Oh, yes, I love YANKEE DOODLE DANDY! Great choice. Sounds like I’ve got a few new musicals to watch. 1776 sounds intriguing. 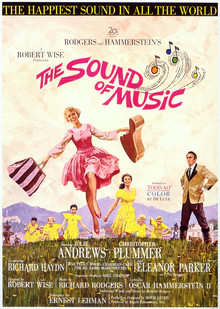 I think, in that case, I would go with the boringly obvious but well-deserved SOUND OF MUSIC. I’m not afraid to admit that I absolutely adore it. I’m also going to say MOULIN ROUGE counts as historical, and it gets another vote from me.